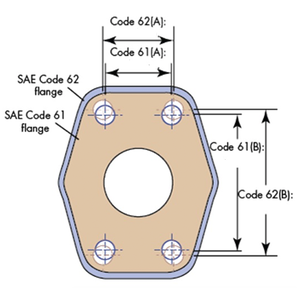 It is important to note that the two flange style codes (61 and 62) are not interchangeable due to their pressure ranges and their different bolt patterns. As shown in this diagram of overlapping code 61 and code 62 4-bolt flanges the dimensional placement of holes are close, but not identical. Note the difference in the bolt-hole’s center to-center dimensions. As shown in the flange diagram and chart below, the distance between hole centers for dimension A in a 2 inch Code 61 versus a Code 62 flange varies by as little as 0.062 inches and for dimension B is offset by a significant 0.75 inches. The flange head on an SAE Code 62 has a thickness which ranges from 0.305 inches on the ½ inch flange to 0.495 inches on the 2 inch flange, where the Caterpillar flange head thickness is 0.560 inches for all 4-bolt flanges. Hence an important distinction as to why they should not be interchanged. A diesel mechanic was installing a new hydraulic motor onto a machine. While reconnecting the hydraulic hose he inadvertently used a 4-bolt split flange that did not line up with the holes on the motor housing. Suspecting the holes in the motor were not tapped in the proper place he filed the holes in an attempt to have them line up with the flange. He essentially modified a 6,000 PSI SAE Code 62 4-bolt flange to mate with a 3,000 PSI SAE Code 61 motor. This was an unfortunate mistake and one that could have been catastrophic to the system if it had been the other way around; modifying a 3,000 PSI bolt flange with a 6,000 PSI motor. An obvious system failure would have occurred, or worse, a system failure that blew the assembly off causing severe damage or physical harm. This is a prime example of the importance of using only matched and properly rated components. This blog is an excerpt from our latest whitepaper, The Major Advantages of Flanges and Flange Fittings.